Students that signed up to the school’s Chromebook Programme proudly took delivery of their brand-new devices at the end of January. The new and improved ‘buy your own device’ scheme was launched in November of last year, and has proved to be popular amongst pupils. The purpose of the programme is to enhance the learning experience by enabling students to buy a device that can access the network while in school and be used freely at home. 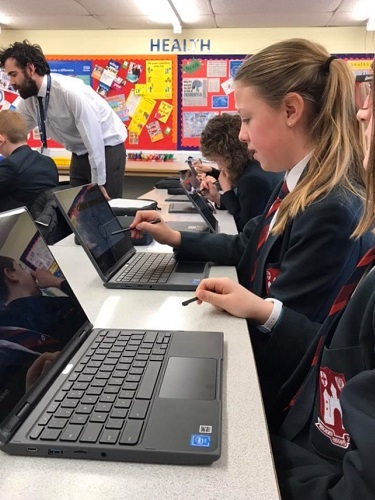 There’s a choice of three Lenovo Chromebook models, which are best suited to student use, in terms of security, ease of use and robust design. After half term, these students will be offered lunchtime ‘iDEA’ sessions to build their skills and confidence in using the Chromebooks and hopefully create some IT champions too. Created by The Duke of York, the Inspiring Digital Enterprise Award (iDEA) is an initiative to help develop digital, enterprise and employability skills. For students interested in joining the scheme, a new round opens on Monday 11th February. Please contact Mrs Underhill at SUnderhill@bridgnorthendowed.co.uk for details.